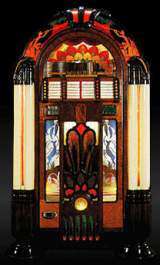 Victory [Model 950] © 1942 Wurlitzer (The Rudolph Wurlitzer Co.). In some ways, the Victory [Model 950] was a visual hybrid between models 800 and 1015. Black metal edging gives this a look reminiscent of ancient Greek design.